Two rookie cosmonauts and a NASA shuttle veteran rocketed into orbit aboard a Russian Soyuz ferry craft Tuesday and set off after the International Space Station. Joining them were 32 medaka fish, bound for a zero-gravity research aquarium aboard the lab complex. Under a clear afternoon sky, the workhorse Russian rocket roared to life at 6:51:11 a.m. EDT (GMT-4; 4:51:11 p.m. local time) and smoothly climbed away from its launching pad at the Baikonur Cosmodrome in Kazakhstan. It was the first manned flight from the remote Site 31 pad since July 1984, a departure from the usual practice of launching station crews from the Site 1 complex used by Yuri Gagarin at the dawn of the space age. Liftoff was timed for roughly the moment Earth's rotation carried the pad into the plane of the space station's orbit and the climb to orbit appeared to go off without a hitch as the green-and-white rocket thundered away atop a torrent of fiery exhaust. Live television from inside the Soyuz TMA-06M command module showed commander Oleg Novitskiy monitoring the automated ascent from the center seat, flanked on the left by light engineer Evgeny Tarelkin and on the right by NASA astronaut Kevin Ford. Novitskiy and Tarelkin are making their first space flights while Ford piloted a space shuttle during a 2009 flight to the space station. 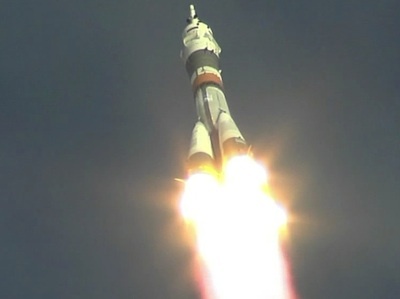 All three appeared relaxed and in good spirits as the Soyuz booster accelerated toward orbit. One of the cosmonauts reported an alarm of some sort shortly after launch, but there were no indications of anything amiss and flight controllers later said there were no obvious problems. The liquid-fueled core stages and strap-on boosters fired and fell away as planned and eight minutes and 45 seconds after launch, the Soyuz spacecraft was released into its planned preliminary orbit. A few moments later, the ferry craft's two solar arrays and communications antennas unfolded as planned. "We congratulate you," a Russian flight controller radioed. "Thank you very much," Novitskiy replied. "All crew members feel good." "Our congratulations to all of you," mission control repeated a few moments later. "Launch was nominal." Over the next two days, the crew will carry out a series of rendezvous rocket firings to fine-tune their approach to the space station, setting up an automated docking at the Zvezda command module's upper Poisk compartment around 8:35 a.m. Thursday. Standing by to welcome them on board will be Expedition 33 commander Sunita Williams, Japanese astronaut Akihiko Hoshide and cosmonaut Yuri Malenchenko, who were launched to the lab complex July 15. They've had the station to themselves since Sept. 16 when the Soyuz TMA-04M spacecraft brought outgoing station commander Gennady Padalka, Sergei Revin and Joseph Acaba back to Earth. Space station managers typically schedule light duty when a new crew arrives to give them a chance to learn the ropes and familiarize themselves with station systems and procedures. But this time around, the new comers will face a busy first week in space with the departure of a U.S. cargo craft, the arrival of a Russian supply ship and a NASA spacewalk to fix a coolant system leak. On Sunday, three days after the new crew's arrival, Williams and Hoshide will use the station's robot arm to unberth a commercial cargo ship from the forward Harmony module, releasing it into open space for a fiery plunge back to Earth and a splashdown off the coast of California. The Dragon cargo capsule, built, launched and operated by Space Exploration Technologies as part of a $1.6 billion commercial resupply contract, will bring about a ton of equipment, experiment samples and other gear back to waiting scientists and engineers, restoring a capability that was lost with the shuttle's retirement last year. Three days after Dragon's departure, on Oct. 31, an unmanned Progress supply ship is scheduled for launch from Site 1 at the Baikonur Cosmodrome. Flying a single-day rendezvous, the spacecraft is scheduled to dock at the Zvezda module's aft port around 9:40 a.m. that morning. In between the Progress launch and arrival, Williams and Hoshide plan to carry out a complex spacewalk Nov. 1 to fix a leak in the coolant system of the station's far left-side solar array. The system circulates ammonia through a large radiator to dissipate heat, and if the leak isn't resolved soon, the station could lose one of its power channels. "The tasks just kind of fall into a place where they need to be," Ford said of the crew's schedule. "We need to take care of our problem outside, so that's why we'll have to get the spacewalk in, and of course, the Dragon is on board and needs to come home on time as well." Williams, Hoshide and Malenchenko plan to return to Earth aboard the Soyuz TMA-05M spacecraft on Nov. 18, closing out Expedition 33. Ford, Novitskiy and Tarelkin then will form the nucleus of the Expedition 34 crew, with Ford taking over as commander. They will have the station to themselves until Dec. 21 when second-generation cosmonaut Roman Romanenko, Canadian astronaut Chris Hadfield and NASA shuttle veteran Thomas Marshburn arrive aboard the Soyuz TMA-07M spacecraft. For their part, Novitskiy, Tarelkin and Ford plan to spend 143 days in space, returning to Earth March 15, 2013.